COMMERCE – A bill recently signed by Gov. Jerry Brown will do little to alleviate health concerns over toxic vehicle emissions along some heavily-traveled truck routes in the region, and is instead raising concerns in cities along the I-710 corridor that there is not enough money in the legislation to alleviate the impact of changes to make truck emission rules less stringent. Senate Bill 1, signed by the governor in late April, raises gas taxes and vehicle fees to generate funds to fix the state’s backlog of crumbling roads. The gas tax hike starts Nov. 1, while the vehicle registration fee increase takes force Jan. 1, 2018. The measures are expected to raise $5.2 billion over 10 years. For cities like Commerce, however, a provision in the bill that exempts most diesel trucks on the road from future emissions reduction requirements for close to two decades is raising red flags. The exemption was added to the bill at the last minute to gain the support of the trucking industry for the higher diesel fuel and registration fees, according to environmental groups who have slammed the legislation as not tough enough. According to Commerce Director of Public Works & Development Services, Maryam Babaki, local residents will see minimal financial benefit from the signing of SB1, but will see a slowing of the movement to achieve zero emission trucks. “This provision is one of the biggest drawbacks of SB1,” Babaki said, adding the policy change increases residents’ risk of health problems. While the bill will result in much needed funds to repair state’s roads, Babaki told EGP it fails to provide relief to smaller populated industrial cities like Commerce. Large cities like Los Angeles will also see greater benefits. The added pool of money is not worth the trade off to residents’ health, Babaki warned. According to environmentalists, reducing or slowing emissions standards will affect residents who live near major truck routes, keeping their risk of cancer, heart problems, asthma and other lung diseases high. The 710 freeway, a major goods movement corridor between the Ports of Los Angeles and Long Beach and the rail yards in Commerce and points further east, has long been identified as a pollution hot spot in large part due to the fumes from diesel trucks. According to the California Air Resources Board, diesel trucks account for 2 percent of vehicles, but emit 30 percent of key smog-forming nitrogen oxides. The Environmental Impact Report for the I-710 Corridor Project states that in 2013, 182,000 vehicles passed through the I-5, I-710 and I-60 corridor, of which 20,000 were trucks. While local residents health concerns are not to be taken lightly, SB1 also fails to provide adequate funding to smaller populated cities to do road repairs or to mitigate the health consequences of the trucking rules because it uses a funding formula based on population. With about 13,000 residents, Commerce’s share of revenue will be small compared to cities like Los Angeles, even though the city is disproportionately impacted by traffic along the corridor. “It is a double whammy,” Babaki said. Babaki compared SB1 to the distribution of transportation funds through Measure M, which also uses a population-based funding formula. Commerce contributes $16 million in taxes annually, but only receives $350,000 from Metro, according to Babaki. Babaki said city officials have voiced their concerns to state legislators to no avail. Campaigning has been underway for months, but Gov. Jerry Brown this week made official, announcing the dates for a Special Election to fill the 51st Assembly District seat left vacant when Jimmy Gomez was elected to the House of Representatives. The primary will be held Oct. 3. If no candidate receives 50% plus one vote, a runoff will take place on Dec. 5. Voters in the 51st district, which runs from Echo Park, through Eagle Rock, Highland Park and on to East L.A., have had to contend with an unusually high number of elections in recent months, a domino reaction to the governor’s appointment of former Congressman Xavier Becerra to California Attorney General at the start of the year. Gomez won election to Becerra’s congressional seat, leaving his state assembly seat up for grabs. More than a dozen candidates have already announced their election bids. SACRAMENTO, CA – Some environmental groups are criticizing the cap and trade bill passed in the California Legislature on Monday, calling it a corporate giveaway that paralyzes local regulators. Governor Jerry Brown is expected to sign a package of bills that passed the Legislature on Monday and will extend the state’s cap-and-trade program through 2030. The cap-and-trade system encourages industry to clean up its act by putting a price on carbon emissions. But environmental groups say Big Oil got too many concessions. Amy Vanderwarker with the California Environmental Justice Alliance says the governor should have started with a bolder vision to move away from oil and gas – and then could negotiate, rather than meeting behind closed doors with big companies from the start. Vanderwarker faults the primary bill, Assembly Bill 398, for preventing local air-quality management districts from further regulating carbon emissions from stationary sources, like heavy industry and power plants. 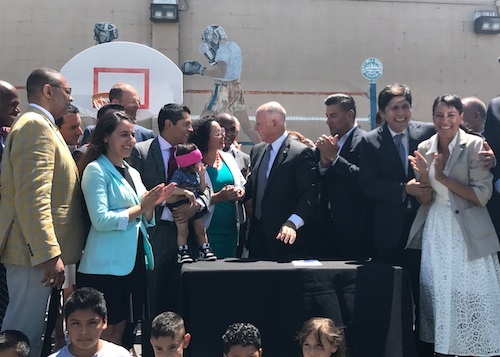 Governor Brown defends the package, saying it’s the best he could do and still achieve the main goal of extending the program, which had to pass by a two-thirds margin and thus required bipartisan support. Alvaro Sanchez from the Greenlining Institute says the devil will be in the details, He urges regulators to prioritize the needs of low-income communities that stand to bear the brunt of climate impacts first – and worst. A companion bill from the Republican caucus also passed. It places a measure on the June 2018 ballot asking voters to make any major expenditures from the Greenhouse Gas Reduction Fund subject to a two-thirds vote of the Legislature, starting in 2024. At a Long Beach ceremony, Gov. Jerry Brown Monday signed into law a bill imposing what he called the nation’s toughest restrictions on “super pollutants” such as black carbon, fluorinated gases and methane. SB 1383, authored by Sen. Ricardo Lara, D-Bell Gardens, mandates a 50 percent reduction in black carbon and 40 percent reduction in methane and hydrofluorocarbon from 2013 levels by 2030. The pollutants are generated by sources including waste-disposal, petroleum-based fuel, agriculture and synthetic gases used in refrigeration, air conditioning and aerosol products. The National Federation of Independent Business criticized the legislation, with the organization’s state director Tom Scott saying it creates an inconsistent policy that will “further increase the cost of doing business in California,” particularly for the agricultural industry.